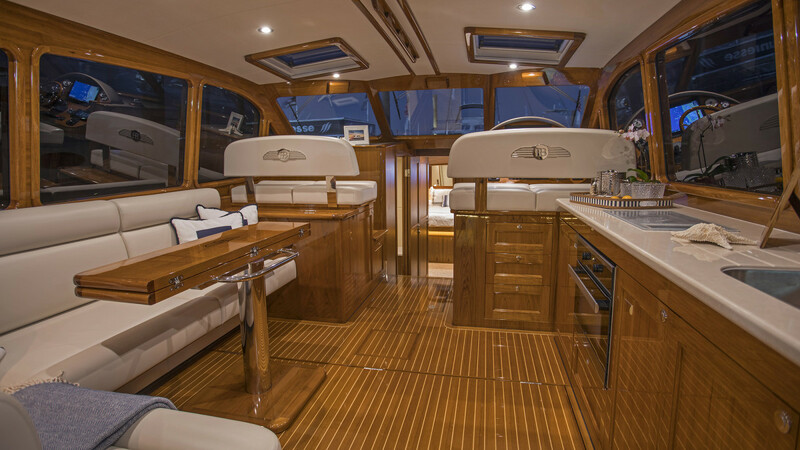 The Palm Beach 45 gives an owner new confidence in offshore cruising. This article first appeared in our sister publication, Yachts International and is reprinted here with permission. I spend most of my days writing about big boats, but I relish getting my hands on something a bit more intimate. 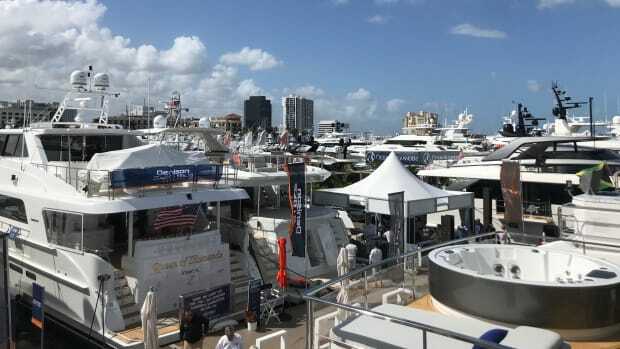 Case in point: joining Palm Beach Motor Yachts owners at Harbour Island for their annual Bahamas Getaway, and wrapping my palms around the wheel of a Palm Beach 45. The moment I put the boat in gear and began carving S-curves, I knew I was holding the reigns of something pretty cool. As it turns out, that’s how a number of Palm Beach owners feel, too. 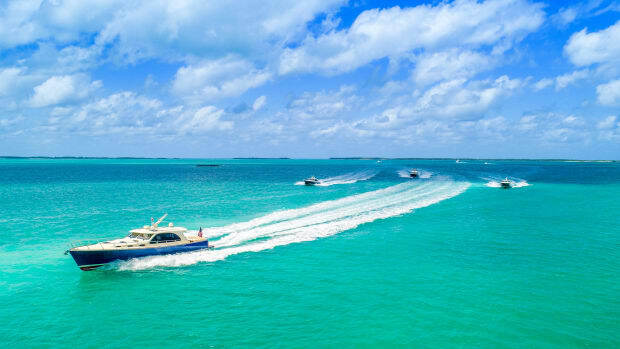 Many of those in the Bahamas had the means to own a superyacht, but their passion was to drive their own boat. They bring their families. They embrace the thrill of going beyond the reef. They have new experiences in new places while making new friends. They’re the kinds of yachtsmen and women that Palm Beach has tried to please since opening its doors in 1995 in Australia. 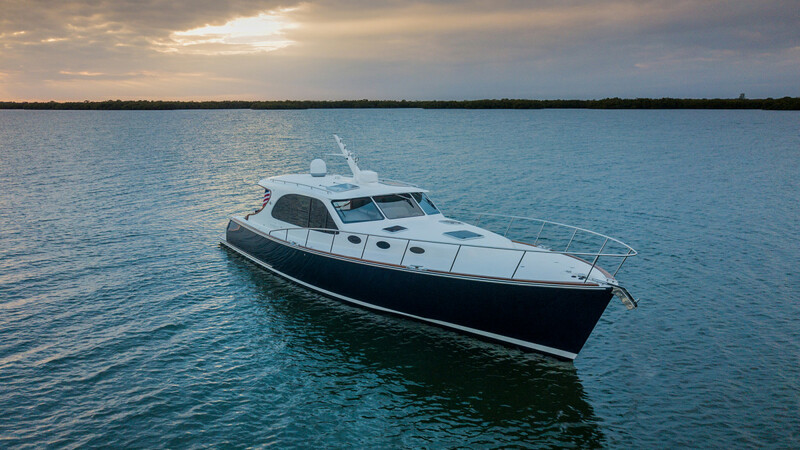 The builder has a line of yachts from 42 to 65 feet (12.8 to 19.8 meters), with a 70 in the works, many owned by the types of boating enthusiasts I met, ones who cast off lines and skipper their yachts confidently across a choppy Gulf Stream to the Bahamas. 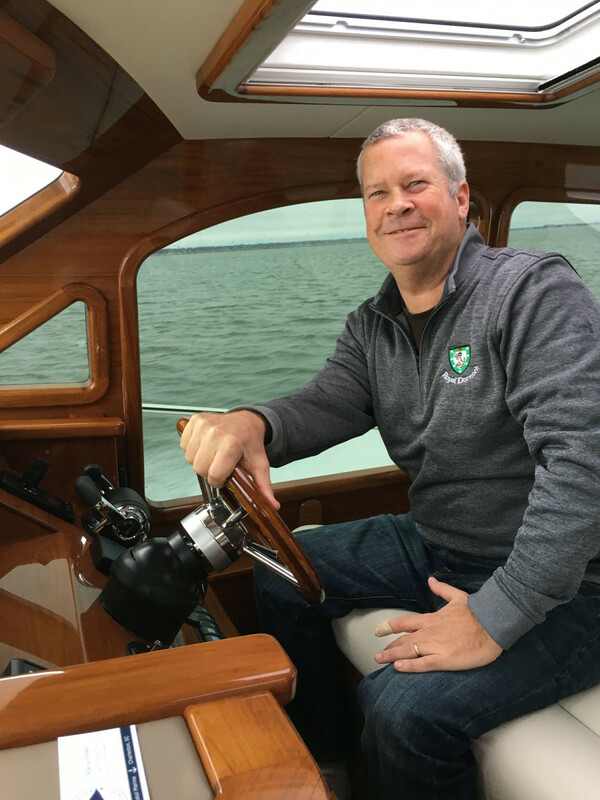 When I took the helm of the Palm Beach 45 On The Rocks, I felt like I was taking the wheel of a Rolls-Royce Wraith. Palm Beach boats are intended for offshore cruising, so I expected her to be robust, but her agility and responsiveness surprised me. 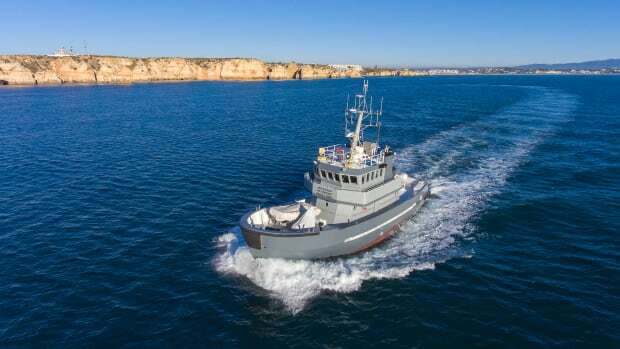 She has a fine point of entry and a keel that extends about three-quarters aft. The narrow entry shifts the center of gravity closer to the center of the yacht—a good place for precise trim. Whether running down sea, head-on or across seas, she tracked like a sports car, carving through waves with smoothness and ease. 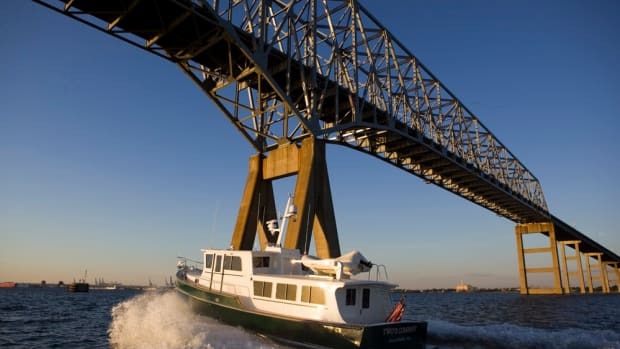 And in rough seas, the shallow draft (the waterline to the bottom of the keel is 12 inches, or 0.3 meters) helps negotiate waves after the fine entry parts them forward of the midsection warp with 6 degrees of deadrise. On board, it feels like someone placed a cushion between the hull and the wave crests. 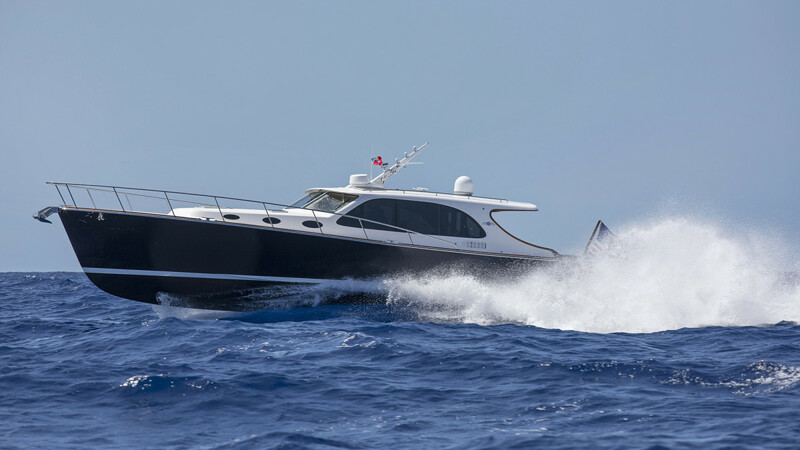 Palm Beach uses a monocoque construction process that bonds all bulkheads and interior furniture to the hull and deck as structural components. 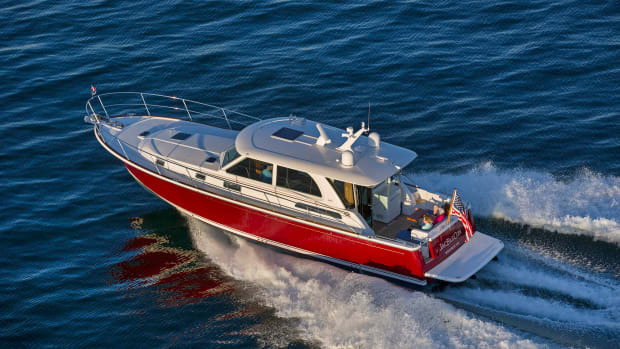 The hull has vinylester resins and a cross-linked, closed-cell foam core for durability. 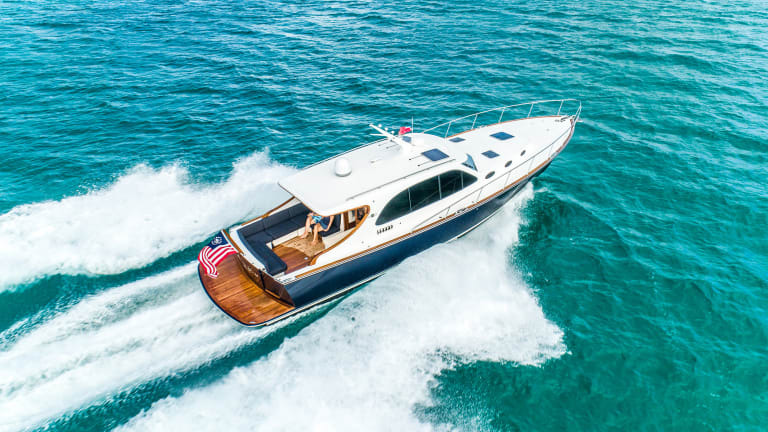 Rated CE Category A—the most stringent Recreational Craft Directive category—Palm Beach boats are built for extended voyages in winds higher than 40 knots and waves greater than 13 feet (4 meters). 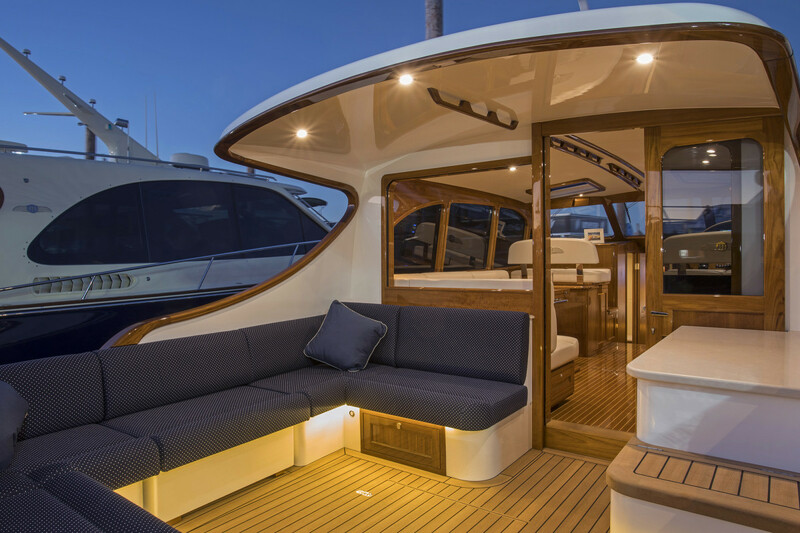 Graceful lines give the Palm Beach 45 a timeless look, while contemporary styling dominates the interior, which has clear sightlines and a panoramic view. 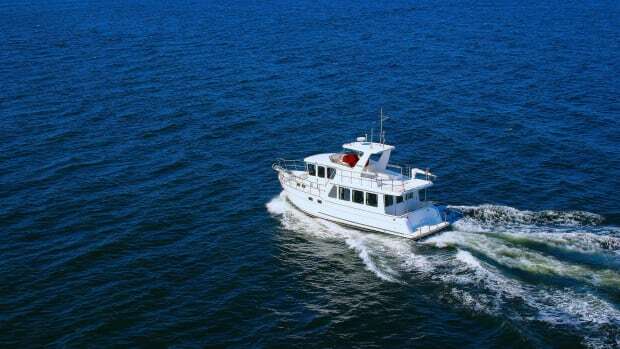 Accommodations are in a single- or double-stateroom layout, dressed in Burmese teak with Ultraleather upholstered furniture, stone countertops, a frameless glass-door shower and book-matched veneers. Also inside are a galley and power windows. The owner of On The Rocks chose to customize his ride further. His change list included a Mount Gay rum tap in the salon. 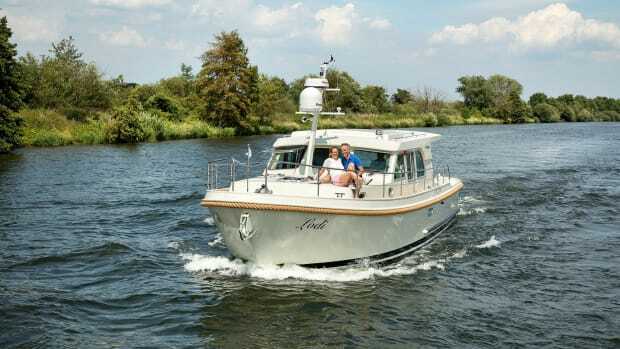 Other customizations included wraparound cockpit seating, overhead handrails, extended teak trim, raised-panel cabinetry, high-gloss soles and helm, and more. And run they do. 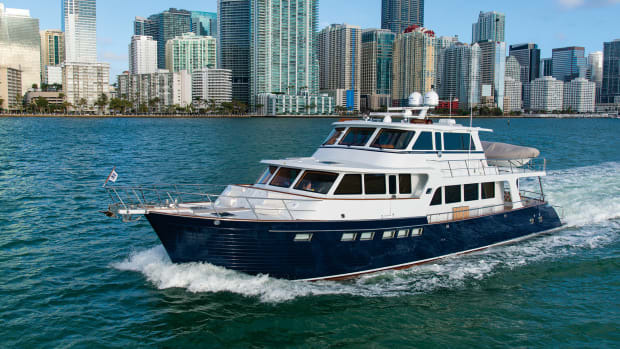 The Palm Beach Motor Yachts Bahamas Getaway marked the first time the owner of On The Rocks made the Gulf Stream crossing.